The Casio EX-V7 packs a 7x optical zoom lens equivalent to 38-266mm into a slim and light camera body. The EX-V7 offers a non-protruding lens with a sliding faceplate that protects the lens and also turns the camera on and off. Other stand-out features of the Casio EX-V7 include a 7.2 megapixel sensor, mechanical CCD shift technology and Anti Shake DSP, and 33 Best Shot Modes. Gavin Stoker took the Casio EX-V7 for a test drive. Casio isn't the first brand that comes to mind when you think of photography � perhaps largely because most of its advertising has been directed at the lifestyle market � but it was in fact one of the first to release and dictate the trend for credit card sized compacts. Its latest fashion accessory, the EX-V7 snapshot camera, recalls recently PhotographyBLOG reviewed models from Sony (the T100) and HP's R837 also. 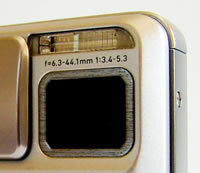 Although here the faceplate that acts as a means of powering up and down the camera slides across to reveal the lens and a flash bulb immediately above. A mix of metal and plastic, the metallic silver EX-V7 feels reassuringly weighty in the palm with the chewing gum stick sized NP50 lithium ion battery inserted. The camera justifies its 'Exilim' tag with a width of just 20.8mm at its narrowest point, making it the world's slimmest to boast a 7x optical zoom (38-266mm equivalent), which itself remains stacked within the body whether in use or not. You also get an attractive shiny black plastic docking station onto which the camera sits upright, attached via an unprotected port at its base, yet angled slightly forward so the 2.5-inch, 230,400 pixels resolution LCD is the focus of your attention. This dust-attracting 'station' sits atop your desk and acts as both a means of recharging said battery and downloading snaps to your PC/Mac, with AC adapter plug, USB lead and AV-out cable supplied in the box. Though you can't tell from its minimal exterior the EX-V7 also boasts the must have of image stabilization, here of the more reliable mechanical CCD-shift variety. Starting at the front then, and below the sliding faceplate featuring the Exilim branding we find a AF illuminator window, next to which are two tiny parallel slits for a stereo microphone. The camera itself powers up in a second or so, the LCD bursting into life nigh on simultaneously. 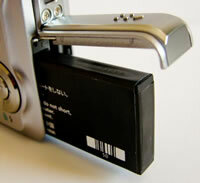 Atop the camera there's similarly nothing to confuse � just a nicely springy, lozenge shaped shutter release button. Press this fully and an image is captured before you can fully blink, while there's a pause of a second at most between shots. The right hand side of the camera � if viewed from the back � features a means of attaching a wrist strap, below which is a slide open compartment that contains both battery and a slot for optional Secure Digital card. By contrast the left hand side is free from any features at all. And so to the back of the EX-V7, which is dominated by a 2.5-inch LCD screen, which is reasonably clear but suffers slightly from image ghosting in lower light. Top right of the screen is a vertically arranged zoom slider with just enough purchase to prevent slippage. It falls readily under the thumb while your forefinger hovers over the shutter button. Operation of the zoom itself is silent and smooth, free from any mechanical jitter, while moving from maximum wide angle to extreme telephoto takes roughly three seconds. Just below the lever is a playback button, and below that the self-explanatory menu button. Press this in capture mode and you're given three sub folders to choose from: record, quality or set up. The record menu gives a choice of auto focus, macro, infinity focus or manual focus settings, continuous shooting, self timer and various anti shake settings. Select any of these and a brief description of their image-taking properties appears at the base of the screen (the 'Icon Help' function, which can be deactivated if it starts to irritate). 'Auto' anti shake claims to minimize the effect of both hand wobble and movement of your subject, then you have the choice of Camera Shake only, Image Blur � which claims to increase light sensitivity, and even a demo mode. You also get the chance to select your AF area � from spot, through multi area and a tracking AF option, turn the AF assist light on or off and similarly activate/deactivate the digital zoom. More interestingly, further options include turning 'quick shutter' or 'audio snap' features on/off, and calling up a nine-zone compositional grid on-screen. The quality folder that's next in line is more self-explanatory, with selectable resolution from seven megapixels down to 640x480 pixels for email friendly JPEG snaps. Next there's a choice of three compression levels � Fine, Normal or Economy, plus the ability to adjust exposure compensation from +/-2EV, manually tweak white balance and ISO (ranging from ISO64 up to ISO800), then metering, dynamic range, apply a noise filter (here called a 'Portrait Refiner'), or the usual colour filter effects. Image sharpness and saturation can also be adjusted in camera, as can the intensity of the flash � quite a comprehensive list of options then for what is first and foremost a point and shoot camera. The third menu folder is the aforementioned set up. This allows adjustment of screen brightness, sound settings � most usefully turning off the annoying beep that soundtracks every one of your selections and actions � plus year/date, language and generally less essential features, apart from the ability to format the card or memory in use in one fell swoop. A useful 'reset' function returns all settings to the factory default if you've activated a number of functions that you come to realize that you shouldn't have. Moving away from the LCD now, and top right of the camera back you have a dime-sized shooting mode wheel illustrated with letters and icons that will be self-evident for anyone who has ever used a digital compact, or Casio, before. These include a red square designating the full auto/snapshot mode. Continuing clockwise around the dial, you next come to the hand holding BestShot feature, which here consists of 33 pre-optimised shooting/scene modes. Press the 'set' button encircled by the four-way controller below the mode dial and a series of thumbnails appears detailing in pictorial form what each of them is for. As well as settings for usual suspects including portraits and fireworks, you also get backlight and high sensitivity settings, as well as twilight and retro (sepia) modes. Next around the dial are separate aperture and shutter speed modes, followed by manual exposure mode, an easy mode (denoted by what looks like a shamrock, and simplifying the on-screen options to just image resolution, flash and self timer) a second BestShot mode for movie clips (including an intriguing silent movie option) and lastly the movie mode proper, with the ability to shoot widescreen ratio clips if desired. All of these options are selected via the four-way control dial that sits below the mode wheel. Press the top edge of the dial, marked 'disp' for display and a live histogram appears on screen. Press it a second time and the screen is wiped clean of all information for clutter-free shot composition. As a default, resolution and image quality, shooting mode and anti shake symbols are displayed on screen, while, when you half press the shutter button, the camera's choice of ISO, aperture and shutter speed pops up momentarily on the LCD. The LCD is really at the heart of all operation on this camera as there's no optical viewfinder to fall back on. Switch to playback mode and captured images and clips immediately pop up on screen. Tabbing through selected shots is instantaneous and at no point do you feel the EX-V7 is at all sluggish or tardy in its response. Press 'menu' again in playback and you're offered two folders. The first, headed with the word 'Play', boasts the choice of a slideshow, constructing a print layout of two or three separate images at once, plus several editing options, including increasing dynamic range, keystone correction, brightness and automatic colour correction. While these won't be much of an added enticement for any Photoshop owners, this is a more varied selection than you'd get from most snapshot compacts in this price bracket. Images can further be re-sized and trimmed. The second playback folder is set up, and features identical settings to those offered in the shooting modes. So, the EX-V7 itself is swift to respond, ergonomically laid out, and its menus and icons relatively user friendly. So far so good, but what about when it comes to the images? And how practical is that bigger than average 7x optical zoom? PhotographyBLOG is a member of the DIWA organisation. Our test results for the Casio EX-V7 have been submitted to DIWA for comparison with test results for different samples of the same camera model supplied by other DIWA member sites.